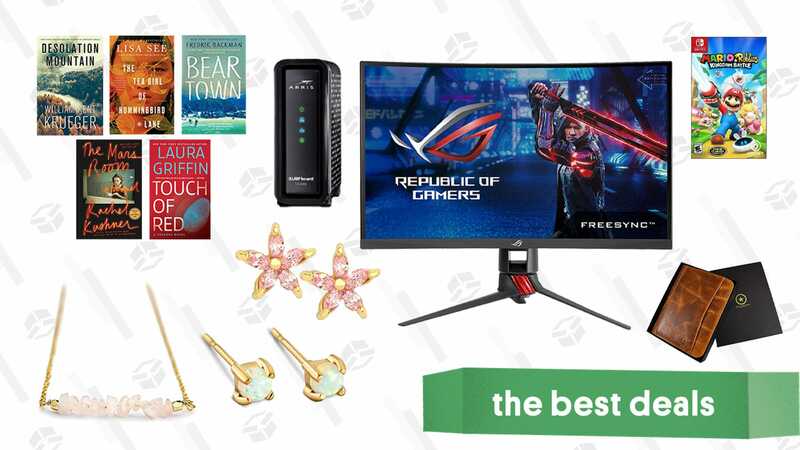 A discounted ASUS Gaming Monitor, Mario + Rabbids Kingdom Battle, and leather portfolios lead off Sunday’s best deals. One of the best gaming monitors, the ASUS ROG Strix 27” Curved Gaming Monitor, is on sale right now. ROG’s line of gaming monitors are the favorite among pros and this $320 FreeSync could help you achieve gaming greatness. We’ve seen it for a few dollars less during the holidays, but make no mistake, this is a solid deal if you’re looking to upgrade your rig. Stop renting your modem from your ISP and buy this discounted Arris model from Amazon today. Depending on your contract and service, you could pick this up for $60 after the on-page coupon and recoup your losses within a year. This specific model is suitable for Comcast, Charter, Spectrum, Cox, and Cablevision. Check with your provider to see if it’s supported, and let that long wait time reinforce your decision to not give them more money than you have to. Which is pretty cool if you ask me. Of course, this deal only lasts the end of the day. Have meetings tomorrow? Command respect with these discounted leather portfolios from Amazon. Each is made from buffalo leather and offer numerous pockets to hold business cards, a tablet, a legal pad, a bunch of pens and more. Prices start at $52 and go all the way up to $95. Amazon is ready to buff your eBook library with today’s Gold Box. Right now, snag copies of best sellers, including Beartown, The Tea Girl of Hummingbird Lane, The Mars Room, and Jordan Belfort’s Way of the Wolf. These titles are just $5 right now, so there’s no excuse to keep these on the digital shelf. The Switch Pro controller isn’t just one of the best ways to control your Nintendo Switch, it might be one of the best gamepads ever made, period. If you have a Switch and still haven’t picked one up, $57 is about the same price we were seeing around the holidays. It’s not a massive discount from its usual $69, but we rarely see it drop below $64. I’m not a Smash pro or anything, but I really enjoy using it for Smash, for what it’s worth. Hugo Award-winning science fiction author N. K. Jemisin collected nearly two dozen of her short stories into a compendium that came out late last year, and you can download a copy of How Long ‘til Black Future Month? to your Kindle today for just $5. With its modular design, free shipping in regular-sized-boxes, and attractive design, Burrow sits on the throne of the direct-to-consumer sofa industry, and you can score a rare deal on the couch (or chair, or ottoman) of your choice during the company’s President’s Day sale. $500 off a $2,500+ order. A loveseat, any couch, or a chair paired with an ottoman will get you over the minimum here. As always, you get to pick your fabric, your leg color, and even the height of your arms, and you also get a 30 day risk free trial, with a simple return process if you don’t like it. I present, for your consideration, these magnetic hooks. They hold 80 pounds if they’re stuck to something upside down, or 25 pounds if they’re on a vertical wall. They cost $11 for a 6-pack. I don’t really know what else to say about them. Hooks! Magnets! It’s all good stuff, and the price is great too. Amazon makes its own laundry detergent now, because of course it does, and you can save on both the liquid detergent and the pods. Get 81 detergent pods for $14, or 250 loads of fabric softener for $15 after clipping the $1 coupon. Now if only they’d build an AmazonBasics clothes folding robot. Microfiber cloths are great for cleaning everything from your face, to your computer monitor, to your car (not to mention packing jewelry), and this 36-pack is back down to just $15 today on Amazon, or a couple bucks less than usual. Well here’s a weird one. AT&T is listing a handful of official Apple iPhone cases—you know, the ones that cost like $40-$50 at the Apple Store—for just $5. Your options are a silicone case in white for the iPhone XS, a leather case in taupe for the iPhone X, and a leather case in multiple colors for the iPhone 8 Plus. If any of the approximately 17 million Arduino projects that Lifehacker has posted over the years have piqued your interest in the affordable electronics board, Amazon’s discounting a couple of starter kits today. This beginner-friendly set includes everything you need to get started for just $28, and the complete set adds a ton more components for $48. With the ability to fold up to practically nothing, and designed to hold a tablet at both typing and video-watching angles, Twelve South’s Compass might just be the ultimate tablet stand. It’d normally cost you $40, but Amazon’s got the black and silver models marked down to $28. But not rose gold, I know, I’m devastated too. Get it for $5 with promo code 45QABN4K, while they last. USB-C Power Delivery is the future, and you can add it to your car with this $14 charger (with promo code MLLEQP8P). In addition to a regular USB port, you get a 27W USB-C port that can charge a MacBook or Nintendo Switch at nearly full speed. If your laptops run off of USB-C anyway, this is a much sleeker solution than an AC inverter. It’s the perfect option for budget-conscious consumers who want to dip their toes in a different kind of home theater. It regularly sells for around $270, and that price was already a great bargain—but this Valentine’s Day promotion is crazy. Use the coupon code PZM4EVER and you’ll have a really terrific 1080p projector. You probably own a Lodge cast iron pan or two that you love, but today, you should add a grill press to the mix. It can be used to flatten bacon or squeeze out unwanted fat if you’re trying to eat healthy. And, if preheated, it can really speed up cooking times by applying heat from both sides. Like all cast iron kitchen equipment, if taken care of properly, it will last a lifetime. If you’re a Prime member, you can get it for a measly $12 right now. J.Crew is no stranger to extra discounts on sale items, but for today only, they’re marking down a whole lot of full-priced styles. All shoppers get 30% off these select items with code COFFEE. The time to stock up on classic sweaters, coats, button-downs, accessories, and more is now. If you’re thinking of going outside anytime soon, this Eddie Bauer sale will serve you well. The outdoor retailer is taking up to 60% off everything on their site (excluding tents, sleeping bags, and non-Eddie Bauer brand products) for their End of Season Sale. So stock up jackets, parkas, boots, and everything else you need for the rest season (or future seasons) before these hot deals cool down. There’s “Eco-Friendly” Gear and Eco-Friendly Gear. This Is the Latter. Listen up, cool guys: Filson, a brand that seems made for some sort of sophisticated outdoorsman, makes our favorite backpack and shearling-collared jacket, and right now on Zappos, you can shop a range of the brand’s apparel and accessories at marked-down prices. Currently on sale, you’ll find plaid shirts, pants, jackets, a couple handsome backpacks, so seize this opportunity to add some casually ruggedness to your wardrobe. You don’t need to be a celebrity like, say, Kate Moss or Mark Wahlberg or Brooke Shields or even a Kardashian-Jenner to score some quality Calvin Klein underwear, apparel, or accessories. In fact, today you can get it for much, much cheaper than usual. Nordstrom Rack is discounting a range of men’s and women’s Calvin Klein styles — everything from boxer briefs and bralettes to tees and pajamas. The iconic brand is back in style in a big way, and just saying, there’s nothing wrong with gifting someone underwear on Valentines Day. Don’t let this deal make you go red in the face; we’re all adults here, so we can all acknowledge that lingerie is maybe the most sought after item on the Valentine’s Day gift list. So pick up a few quality pieces at Journelle, which happens to be taking 25% off lingerie from their Journelle Collection through February 10 with promo code HEARTEYES. Their stuff is known for being well made, size inclusive, and actually attractive, so no red flags when it comes to this sale. They might not be as fast as the Millennium Falcon or as maneuverable as a real tie-fighter, but at just $35, these Star Wars-themed quadcopters are more fun than a game of holochess. At checkout, you can choose between the 74-Z Speeder Bike, Tie Advanced X1, and T-65 X-Wing Star Fighter, all for the same price. Keeping an eye on your blood pressure? This smart cuff can sync with your phone to help you keep track of trends overtime. Plus, it’s only $69 right now on Amazon. Nice. With apologies to anyone that bought an Arcade1Up 3/4 sized arcade cabinet with just a few games, you can now buy one with 12 games built in, and it’s on sale for just $300 at Target right now, complete with a 12″ riser to bring it up to a more comfortable height. Normally $400, the Deluxe cabinet includes the following games, and authentic artwork on the sides of the cabinet to boot. Don’t forget, you can sign up for a Target REDCard as well to save an extra 5%. They even have a debit option that draws directly from your bank account. Samsung’s quantum dot-powered Q8 TV isn’t exactly easy on the bank account, but it would be a stunning upgrade to your home theater, and you can save $400 on the 75″ model today, or $600 on the massive 82″ model, compared to what you’d pay elsewhere. Okay, so with that background out of the way, Samsung’s 2018 Q-series TVs utilize quantum dots to great effect. This Gizmodo review is about the 2017 model, but most of it will still apply to this set. This being the higher end Q8, it further enhances the picture with features like local dimming and Samsung’s best HDR engine. Just note that if you want the 82″ model, you’ll have to select it at checkout. Don’t need a TV quite this big? LG’s stunning OLED sets are on sale too. I’ve already told you why you need extra smartphone car mounts to keep in your luggage, but if you still haven’t heeded my modest proposal, you can grab three of them for just $8 total today from Daily Steals’ Facebook marketplace. That’s the best deal we’ve ever seen on magnetic vent mounts, and it means you’ll have one to put in all of your suitcases. While Anker’s Roav dash cam line might have started with affordable, basic cameras, the C2 Pro is anything but. With a low-light Sony sensor, built-in Wi-Fi, GPS logging, and an included 32GB microSD card, you’ll be more than ready to capture whatever the road throws your way. Who knows, maybe you’ll even be featured on Jalopnik some day. Get it for $110 ($40 off) today with promo code ROAVAPC9. Who said desk lamps have to be boring? Aukey’s new RGB table lamp features six lighting modes, four lighting effect speeds, and four brightness levels. And oh yeah, it’s a freakin’ circle. Set it to project rainbow colors around the room, or use it as a study lamp late at night. Either way, it’ll be an illuminating conversation piece. Just be sure to use promo code VSVGACI3 at checkout to save $8. Winter is all about layers on layers on layers — and Patagonia has vests, puffers, pullovers, and zip-ups galore, all of which are great for wearing alone on warmer days or all at once when it’s an arctic tundra outside. Right now, the winterwear purveyors are majorly marking down their Web Specials section for a limited time. So it would behoove you to pile everything you can into your cart ASAP, so you can pile everything onto yourself during the remaining cold months ahead. Valentine’s Day is right around the corner, which means lots of deals on lingerie and pajamas. The latest retailer to mark down various underpinnings is Urban Outfitters, which has pledged up to 40% off their range bras, underwear, bodysuits, in addition to a whole lot of loungewear — some of which looks to me like just regular clothes I would wear outside. This sale will only last for a limited time, so go ahead and sift through its many varied offerings ASAP. Razor burn. Acne. Sun spots. Scars. Wrinkles. Watch out! You don’t want to miss this Timex Valentine’s Day sale. Now’s the time to take advantage of 20% off a selection of Timex watches for men and women with promo code CUPID20. And — bonus! — shipping is free. But you don’t have a minute to spare; shop now before the clock runs out on these deals. Humble’s newest bundle features games with swords, magic, and dragons, like Age of Wonders II: The Wizard’s Throne, Darkest Hour: A Hearts of Iron Game, Magicka 2, and more. All of the games in this bundle are available on Steam for Windows and some for Mac and Linux too. LG’s OLED TVs have achieved something of a cult status thanks to their inky dark black levels and vibrant colors, and today, you can score the best prices we’ve seen on the 2018 B8 models with a couple of refurb discounts on the 55″ and 65″ sets. Update: While the 65″ B8 we originally posted sold out, and the 55″ increased in price by $30, Walmart has added two new options to this sale. You can get a 55″ E8 OLED set for $1379, which includes a better image processor than the B8, a glass-framed body, and a better sound system (you can read more about the differences here). Or, you can opt for a 65″ C8 for $1999, which has the better processor, but not the improve aesthetics of the E8. The picture quality should be nearly identical to 2017’s ultra-popular LG sets (which is a good thing! ), but the 2018 models include LG’s ThinQ voice assistant and support for HFR (high frame rate video) up to 120 FPS. HFR content doesn’t really exist yet, but a few movies are expected to come to streaming services starting later this year, so if you’re planning on using the TV for several years, it might be worth it for future-proofing purposes. Walmart has the refurbished 55″ marked down to $1,149 $1179, and the 65″ to $1,749, complete with a full one year warranty. If you insist on still using a paper planner (no judgement; everyone has their ~process~), it should at the very least be a planner that’s interesting and — dare I say? — fun to look at. Erin Condren gets it; the brand has been making artfully designed planners, stationary, and other paper products for years. But right now, you can get yourself a Hardbound Lifeplanner or Erin’s signature Lifeplanner for 40% or 25% off, respectively. The Hardbound Lifeplanner looks more like a traditional notebook on the outside, while the Lifeplanner, Erin’s signature, comes in a range of designs to suit any taste. the Lifeplanner can also be customized on the inside and out, which is great because I love buying things that literally have my name on them. Plan to take advantage of this planner deal soon though, so you can stay on schedule for the rest of the year. TOMS are well-known for one kind of shoe — you know what we’re talking about — but in case you’re not up to date, the brand actually offers a whole range of other, more winter-appropriate styles. Whether you’re looking to test out classic TOMS or something new, check out their already marked-down sale section and get an 20% off with promo code BYEWINTER. But don’t walk, run to take advantage of this deal. Anker makes a sound bar now, which…yeah, that makes sense. It’s 35″ and features two integrated subwoofers for 2.1 channel audio inside a single box. And naturally, it’ll also work as a gigantic Bluetooth speaker, when it isn’t pumping audio out of your TV. Private Internet Access is our readers’ favorite VPN, and to celebrate the official launch of their fancy new app, they’re offering the best deal we’ve ever seen, exclusively to our readers. Just sign up for a year of the service at $40 through this link, and you’ll get five months added to your membership for free, compared to the three months they’re offering the general public. That’s only about $2.35 per month!